Aaron Paul is sooo boring he almost ruins it, but this is still an entertaining guilty pleasure B-movie. The make-believe Need for Speed doesn’t have as much a strong plot as it has nifty outrun the cops scenarios, some run cross-country in time scenarios, and a big race finale on the Mendocino, California coast. As a fast car movie, it has superior cinematography to any of the “Fast & the Furious” entries which it will be inevitably be compared to. The aerial camerawork is smooth gliding, the fender cams are done skillfully, and the crash cams are wicked spectacular – none of which is done without too much over-splicing in editing. This is a cinematic equivalent of a home-crafted beer with a satisfying smooth finish. I’m warning you though, this movie is dumb. Or dumb fun! There’s Paul (TV’s “Breaking Bad”) as this hopeful stock car racer named Tobey Marshall with an auto shop, and his loyal crew, who sticks by their boss to make sure he, uhh, drives well. 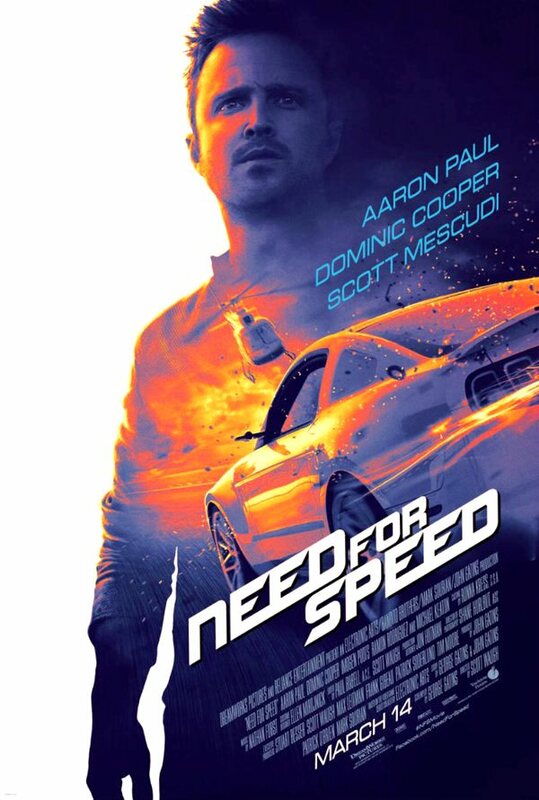 He gets into a street race with his nemesis Dino Brewster (Dominic Cooper, well-played) that turns tragic for third racer Little Pete (Harrison Gilbertson). It’s not Dino who takes the rap for his death, but Tobey. After two years in jail, Tobey gets out so he can compete in a cross-country race that will require him to go from upstate New York to the starting line in San Francisco with just a little more than 24 hours to get there. Somehow, the spunky Brit Julia Bonet (Imogen Poots) will be along with Tobey for the ride – sometimes a smart-talking bad girl brings something to the party, right? She is hilariously shoehorned into the story, but indeed, she volunteers to be in the passenger seat and exemplifies grit. The second improbable character is Benny (Scott Mescudi), an Army helicopter pilot and ally who directs traffic correspondence from the air on behalf of Tobey. This lends to a gratuitous – but yes, hilarious – pick-up in Detroit of Finn (Rami Malek), an auto technician who must banish his white collar job in style and re-join the crew. Yes, this movie gets braver and better as it goes along. The scenarios that Tobey are thrust into are very videogame-like scenarios, which I’m reminded that “Need for Speed” debuted in 1994 on several fifth-generation high-bit game console platforms, and saw many game sequels. 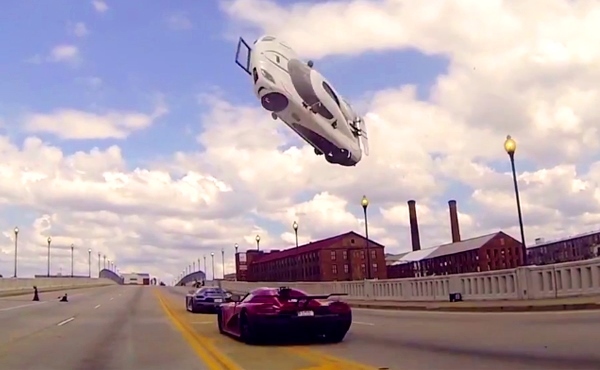 Death-defying leaps over traffic and a convoy lift of car into the air by helicopter are movie scenes that happened in games time and time again. Tobey is too much of a stoic-posturing dolt (Chris Hemsworth or Ryan Gosling in for dry stoic stock character humor, would have been better choices), but after awhile, we don’t need him to speak when there’s a good Poots in the car. 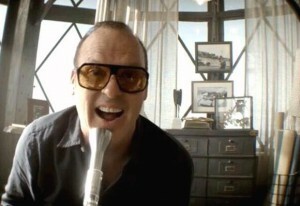 But it’s the uproarious Michael Keaton who supplies all of the movie’s best verbal fun. 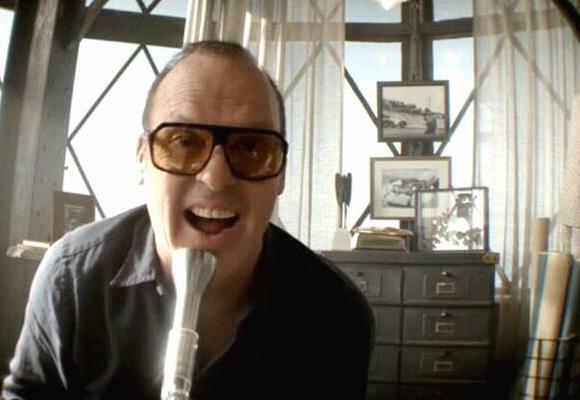 As the Monarch, Keaton is an eccentric millionaire and racing impresario who broadcasts commentary from the internet. From scanners on the police or syndicated media airwaves, he miraculously knows everything that is going on and perhaps understands the film’s plot better than we can. Keaton has a blast building up the mythos of the car racers for the final race – which is as awesome a race as there’s been in a Hollywood movie in eons. I only wish a few more baddies had been run off or flipped off a cliff. Yes, I became dangerously immoral with a depraved sense of humor for a few minutes from this movie. Film Cousins: “Smokey and the Bandit” (1977); “The Cannonball Run” (1981); “2 Fast 2 Furious” (2003); “Rush” (2013).